Here are all of the free resources mentioned in the Operation Brewery book. We hope you find them useful. For additional support, please check out the free Black Hops Ambassadors community or to grab a copy of the book please check out the online store. For any questions that aren't answered in the book or on this resources page, check out the Black Hops Ambassador group on Facebook. Dan, Eddie and Govs are active in the group, its free to join and has hundreds of members already. 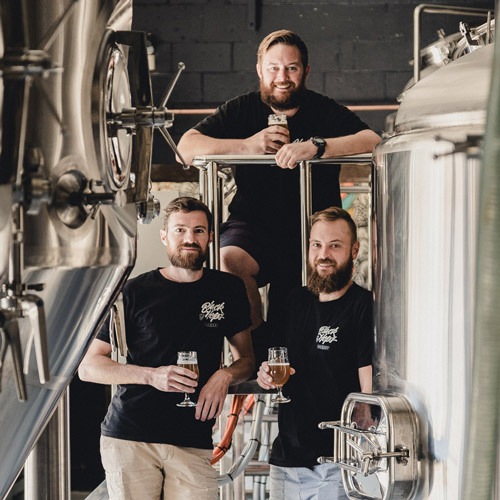 We will answer your questions on business and brewing in return for you supporting Black Hops when we need a crew to get behind any of our projects. Check this out for Govs’ original post on how to brew an Eggnog stout. 9cm wide x 10cm high sample Photoshop (PSD) template for tap decals. A PowerPoint version of the investor pitch deck we used to raise investment. Use this 10-week list of tasks (Trello board) to plan out your next crowdfunding campaign. Download our full library of 200+ equipment images from our trip to Tiantai in China. Download a full list of the initial prices for our equipment from Tiantai. Social media handles @blackhops beer: Facebook, Instagram, Snapchat, Twitter. Here are all of the free resources mentioned in the Operation Brewery book. We hope you find them useful. For additional support, please check out the Black Hops Ambassadors community.